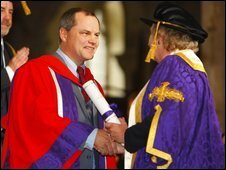 Mr Dee said he wished he had "tried harder at school"
Comedian Jack Dee has received an honorary degree in a ceremony at Winchester Cathedral. The 47-year-old comic, who grew up in the city, accepted the accolade from the University of Winchester. The degree was in recognition of his outstanding contribution to comedy, drama and the performing arts. Veteran broadcaster Sir David Frost, who lives near Romsey, also collected an honorary doctorate at the ceremony on Wednesday. Mr Dee said: "I'm very pleased, I was hopeless throughout school. "I left with four O levels and one A-level at grade D.
"Since then, I have subsequently wished I'd tried harder at school and made more use of the opportunities that were available. "On the other hand it has worked out okay. "I don't want [my kids] to think they can get a degree without working even though their dad did." Dee was a pupil at The Pilgrims' School, Montgomery of Alamein School and Peter Symonds' College, Winchester.